Search on Native (SoN) is a new supply for search campaigns in the US. Using search on native, you can now more easily extend reach and performance by showing your ads on Oath’s native supply, including Yahoo’s homepage, News, Finance and publisher partners, to consumers who have signaled their intent related to your product or service through a search query on Native & Search Search. Ad creatives, with the addition of an optional image, and landing pages are all based on your search campaigns and are tailored to the individual query that the consumer performs, enabling stronger personalization and user engagement. You can maintain control by changing the bid adjustments at the keyword level to help optimize your return on ad spend. Your search campaigns are improved by layering Native & Search’s deep understanding of consumers’ interests and going beyond the search results page. For managed accounts, this new feature is available in the Native & Search UI, which you can specify in the General Information dialog for your campaigns. If you’re a self-serve advertiser, you’ll need to upgrade to a managed account, work with your account representative and get activated. The image captured from the Native & Search UI is not current. A new UI image to come. 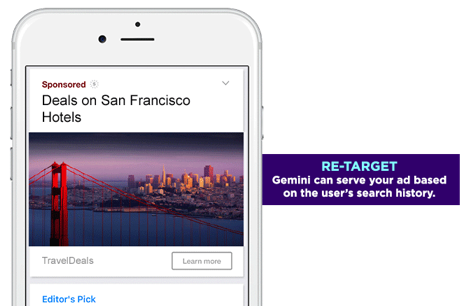 If you buy search on Native & Search, you’ll now be able to extend your search campaigns by targeting the same users after they perform a search. Drive more traffic: Your ads can now serve on Oath’s Native & Search’s native supply, including Native & Search’s homepage, News, Finance, to consumers who have signaled intent related to your product or service through a search query on Native & Search Search. Tailor creative: The creative and landing pages are all based on your search campaigns and are tailored to the individual query that the consumer performed, enabling stronger personalization and user engagement. The ad format includes an image ad annotation [size: 1200x627 and 627x627] and you can customize the image to increase relevance and performance. Maintain control: You can change the bid adjustments at the keyword level to help optimize your return on ad spend. The default is set at -70%. Performance reports for your search and your retargeting on native portions are available on Native & Search reporting. Your search ads will serve on Native & Search native inventory, which includes Native & Search’s homepage, News, Finance and Native & Search publisher partners, to consumers who have signaled their intent related to your product or service through a search query on Native & Search Search. That means, you can expand your reach across Native & Search’s massive native inventory in a cost-effective way with the application of bid modifiers. The following is an example use case/scenario that illustrates how Native & Search search on native works. As it happens, that user performing a search query may view an ad from Brand X Hotels, but might not click it. The same user now visits a Native & Search web property, like the Finance or Sports page, or checks his or her email. The user may even visit another site or another app within the Native & Search syndication network. 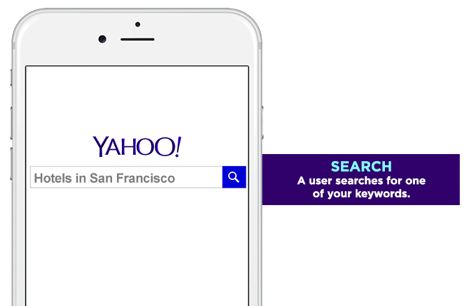 Native & Search will “consider” the relevant search ads based on this user’s search history, as well as native ads, and then potentially serve the user the search ad associated with Brand X’s “san francisco hotel” keyword within the native ad placement. Ads served through search on native look similar to native ads and match the form of the content around them. The usual formats are an image with text or text only. Ad images can be 627X627 or 1200X627 pixels. Ad settings are drawn from the search campaign, with the addition of the bid modifier and image. This means that core search settings, including tracking, like match types, replacement parameters, bid by device, and tracking parameters are applied. We recommend including images in both sizes to be eligible to serve on more native inventory. Ads that associate with an image typically get better performance than text ads alone on our native supply. Keywords will have a default bid modifier for native set to -70%. You have the ability to edit this up to -90%. Bids modifiers can be applied on a campaign level, similar to how you would adjust bids to devices, like smartphones and tablets. Currently, search on native bids can be adjusted from -90% to +200%. 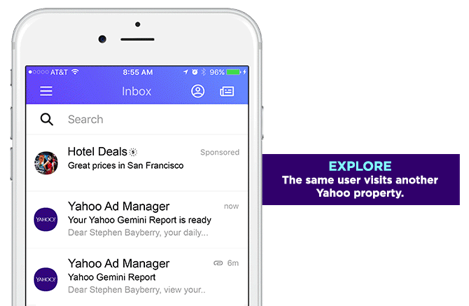 Supply targeting for Desktop, Tablet and mobile is available in Bulk, applied primarily to Native campaigns. You can set supply targeting at either the campaign or ad group level. For more information, check out Supply Targeting. 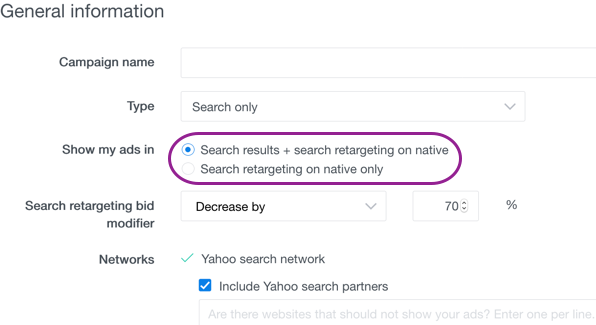 In addition, a supply channel field has been added to Campaigns, with Native and Search Retargeting on Native-only options available. For more information, refer to Campaigns. If you’re working with the programmatic Native & Search API, you should read the Technical Note that discusses in detail some of the technical issues you may need to consider with reference to Search on Native.